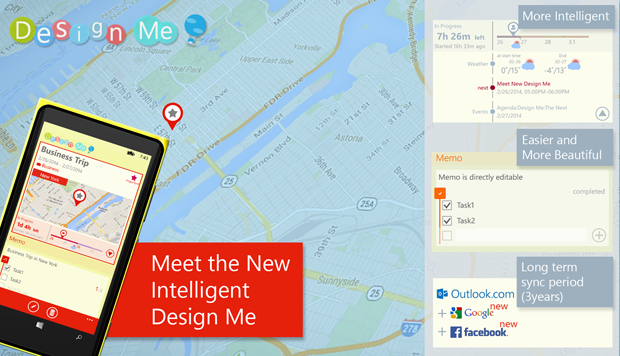 Hi, I've released a new application named "Design Me" and it has just been updated v.1.3.0.0. "Design Me" is a powerful tool to design your life. Design your future and keep your moments with "Design Me". Design Me is the app for designing people's life. You can easily recognize information by the app like what are you going to do today, when you wake up tomorrow, how is the weather today. You also can check daily quotes enlighten yourself. Design Me monthly calendars are filtered by the schedule's importance. So you can easily know what the important schedules are in any month, for example, friend's birthdays, holidays and important meeting. And this calendar allows to sync with Outlook.com. You can edit or delete you schedule and it's even possible to add categories and attach To-do and Place Note to a schedule. You can easily keep your moments with Live Note in the app. You can leave pictures, videos, voices, places, ideas and emotions easily to Live Note at any moment. If you have any feature you'd like to see in this app, Please let me know below. Last edited by lunelake; 03-06-2014 at 01:28 AM. david90531, JerseySal, AngryNil and 2 others like this. Thank you for your consideration of my app. I'll participate in other forums. Absolutely beautiful app!! Very well designed. I was thinking to purchase Daily Dashboard, but this is even better aesthetically I think. If I get this then I think there's many apps I can say bye too. Make more speed improvement and even more features please! But I need time for this. If you have any features you'd like to see in this app, feel free to tell me. Awesome. Look forward to them. I would like the ability to customize the calendar a bit more. And also showing facebook friend's birthday would be nice. Also for the notes if you can make a to-do list option that would be nice too. Congratulations on a very beautiful app. The design is gorgeous. One suggestion is for the medium size weather tile to have the weather for the next few days on the back. lunelake and JerseySal like this. Very useful app. Good stuff! More livetile options, more calendar view, performance improvement, I'm working for it now. You can see it within the next few weeks. I prepare new livetile custumizing options. You can get it in the near future. seems to have gone quiet on the designme front! - is it still being developed? i also wanted to ask if its possible to allow the chosing of a custom sound for the alarms, on the stock app, you can see other custom sounds i have made to select, with the designme alarm app there seems to be only a list of included sounds and no choice to choose anything else. I've had personal matters lately. So updated version of Desing Me is delayed, much more recently I start my work of DesignMe again. Can you tell me the stock app's name?I knew as Windows Phone API doesn't suport to let the app access your custom ringtone stored at your phone. If it's possible, there is no reason not to support it. But if it's not possible, don't worry about that. I've already got a idea for solving it. david90531 and Qtweeder like this. hi lunelake, hope things are well with you!! - yes, the standard WP8 app i was talking about is the included "Alarms" app, that simply enables you to add your own song/sound under custom section that appears if you have previously added your own ringtone or similar. 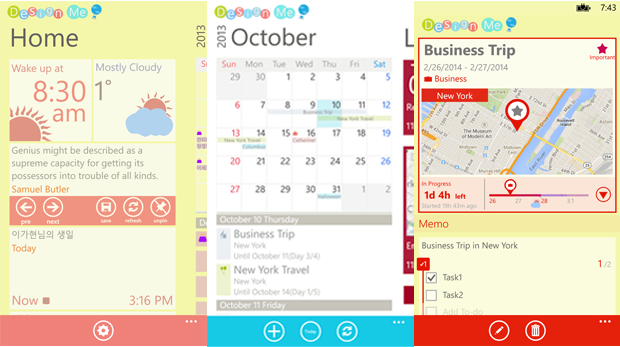 "Alarms" app is a native app of Windows Phone. So it's possible to access your custom ringtone. But it doesn't allow to 3rd party app. I hope Microsoft changes it when windows phone 8.1 release. If you can see strange expression while using app or you'd like Design Me to support new language , use Design Me Language support center. Last edited by lunelake; 12-23-2013 at 01:42 AM. Design Me has just been updated v.1.2.1.0. Sorry, you can get new update soon. I think u replied on my facebook page. So I think you already saw my reply. wow, nokia store holding new update release sooo long! Design Me gets updated to v.1.3.0 with lots of improvements!! -directly edit to-do and memo at schedule viewer page. How to copy contacts from lumia 520 to e5 plz tell me? Give me ideas about your battery charger? Profile pic on Me tile keeps changing.